Celebrate the season with this Summer Chicken Salad. Chicken breast, 2% Milk VELVEETA, reduced fat sour cream, lemon zest and dill weed make for a creamy and flavorful sauce in this better-for-you Summer Chicken Salad. Cook chicken in boiling water in covered skillet 15 to 20 minutes or until chicken is cooked through. Meanwhile, mix VELVEETA, sour cream, lemon zest and dill weed in medium saucepan; cook on low heat until VELVEETA is melted, stirring occasionally. Cut chicken into 1/4-inch-thick slices. 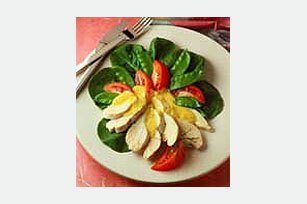 Arrange on individual lettuce-lined plates along with tomatoes and pea pods. Drizzle with VELVEETA sauce. Use a visual test to ensure boneless chicken breasts are thoroughly cooked. If meat is totally white with no pink color, it is safe to eat. Here's a deliciously different main-dish salad. The pea pods provide a good source of vitamin C and the cheesy sauce adds a good source of calcium.